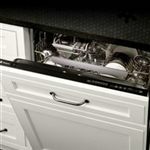 A look of seamless perfection, this dishwasher fully integrates into your kitchen cabinets; not protruding or sticking out past the counter top. No spot goes unclean with the 102 washing jets that get in hard to reach areas. 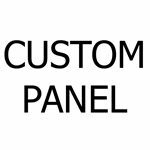 User-friendly LCD display makes choosing the setting you'd like very simple. Hard to hear, this dishwasher registers at only 42 decibels! 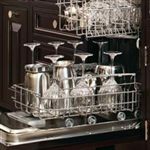 Choose from custom, panel ready dish washers that match your cabinetry or stainless steel with a professional style or European style handle. 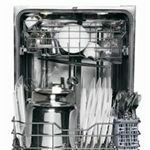 The Dishwashers ENERGY STAR® GE Monogram® 24" Fully Integrated Dishwasher with 102 Cleaning Jets by GE Monogram at Jordan's Home Furnishings in the New Minas, Halifax, and Canning, Nova Scotia area. Product availability may vary. Contact us for the most current availability on this product. 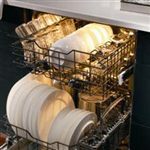 Enjoy your sparkling clean dishes and cookware thanks to GE Monogram®'s line of innovative, attractive, and high-performing dishwashers. Choose the model that best suits your needs, with a wide range of features such as stainless steel tubs, bulk dispensers, high-powered Xenon lights, a host of others from which to choose. 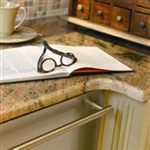 Additionally, custom panel models in the line (requires separate purchase of panel and handle) allow you to put your own unique touch on your kitchen design with the panel and handle of your choice, making your kitchen indelibly yours.